Mushoku Tensei: Jobless Reincarnation is a new fantasy manga based on a series of light novels that have become a bestselling sensation in Japan. Initially appearing as a series of web novels, Mushoku Tensei: Jobless Reincarnation was then collected into print editions, and quickly rose to the top of the light novel charts in Japan. 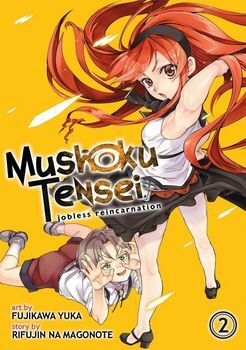 Mushoku Tensei: Jobless Reincarnation is an ongoing manga series. Each volume contains highly detailed fantasy artwork, and includes colour inserts. This manga series is sure to appeal to fans of Sword Art Online, Log Horizon, and No Game No Life, which all focus on a similar genre of a hero transported to a strange new world. Just when an unemployed thirty-four-year-old otaku reaches a dead end in life and decides that it's time to turn over a new leaf-he gets run over by a truck and dies! Shockingly, he finds himself reborn into an infant's body in a strange, new world of swords and magic. His new identity is Rudeus Grayrat, but he still retains the memories of his previous life. Follow Rudeus from infancy to adulthood, as he struggles to redeem himself in a wonderous yet dangerous world.